Twenties And Fabulous by Kristen Berk: Outfit of the day: Zara, Guess & JustFab Shoes! 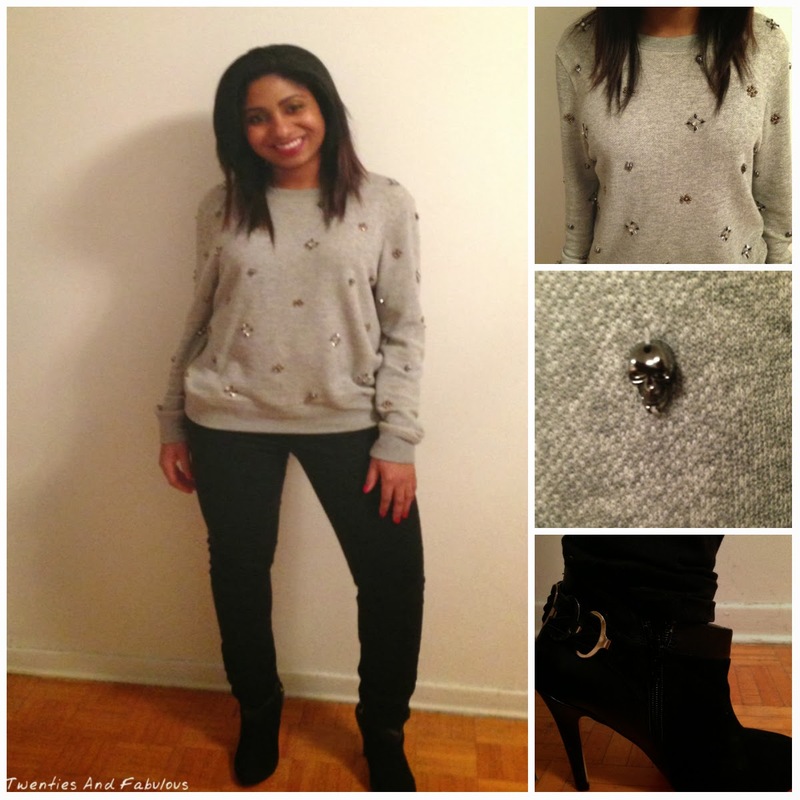 Outfit of the day: Zara, Guess & JustFab Shoes! With the cold weather upon us its sometimes hard to make an effort to look good, especially when you are piling on layers like I do to keep warm. So, in an effort to ensure I looked good while staying warm during the winter months, I decided to focus on sweaters that have details and were basically accessories, so there is no need to worry about adding necklaces or extra bits and bobs to the outfit. The sweater shown above was purchased at Guess. I know when the store Guess comes to mind one does not usually imagine a long sleeved concealing sweater, but sometimes shopping at Guess can truly be surprising. If you bypass the spaghetti bedazzled tank tops (not judging) and head to the sale section, you can sometimes walk out with a really unique piece. 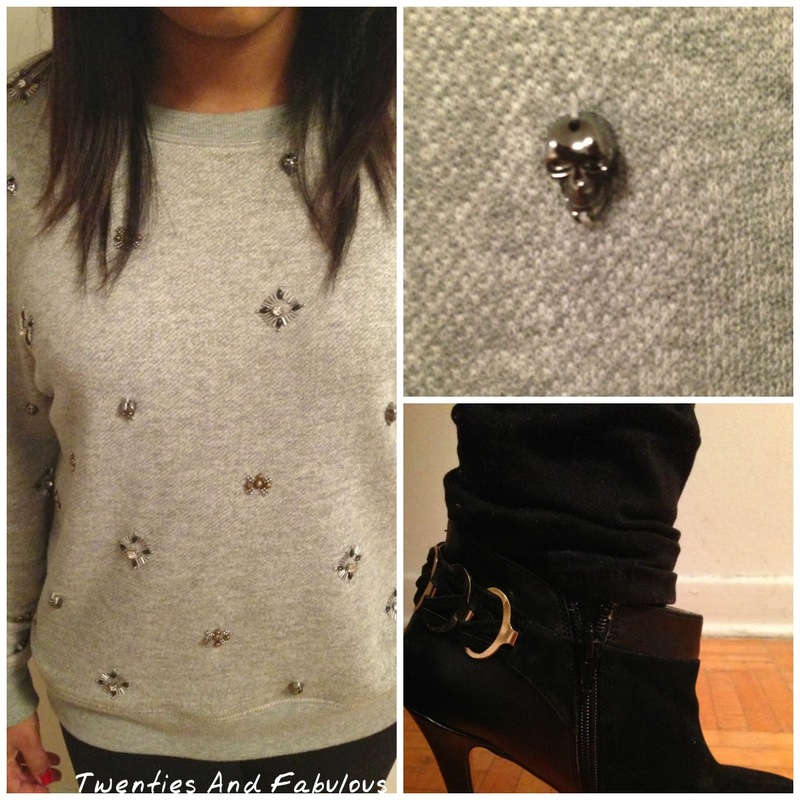 I decided to pair my grey floral and skull beaded pattern Guess sweater with a pair of black jeans from Zara. I'm not sure what it is about Zara jeans, but I really like them. Little secret: I own three pairs of these exact jeans in the same color- black. I guess when you like something, you really like it and need to stock up before it gets discontinued (my worst nightmare). To complete the overall look of the outfit, I added a pair of booties from JustFab! These booties have nice gold detailing, which helps to compliment some of the gold beading that is on the sweater. As well, the best part about these booties is that they are very affordable which is great for any girl with a shoe obsession. Overall, this look is simple, classy and is a very achievable look for any girl.